And we’re back again for more play time in the kitchen! On a related, if off-the-mark note, how cute are these? I got them as a joke for my husband, who would always look cross-eyed at any recipe that used “a pinch of salt” or “season to taste”. Turns out, the DASH spoon is 1/8 teaspoon. 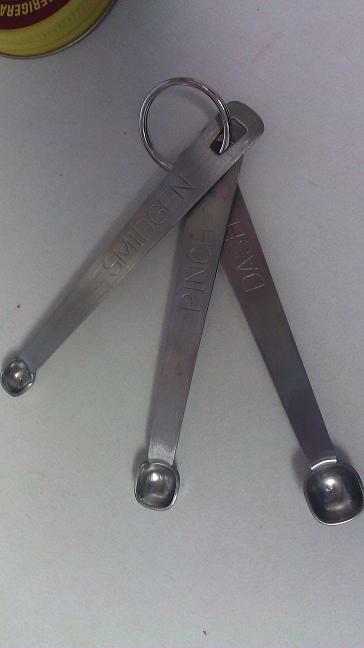 Super handy for measuring yeast! After the mishaps with yeast buying, and a few helpful tips from Cindy (she of the AMAZING birthday cake), we were set. Milk, eggs, butter, sugar, flour, salt, yeast. Can do. Being my first attempt at bread, I wanted to try something simple. 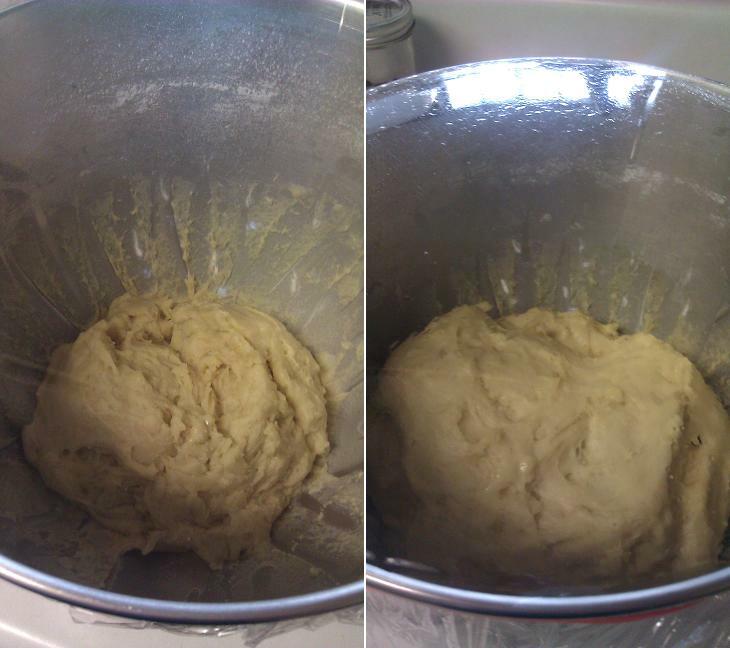 The recipe for Sally Lunn Bread (again, via Smitten Kitchen) required no kneading. Um, a full on real bread, without kneading? SOLD. The write up promised that it would be a dense, slightly sweet bread … almost like a brioche, without the hours and hours of work. Let me tell you, Alice had her work cut out for her. During that final mix (after the last of the flour), she was bucking all over the place. I think I’ll do that bit by hand next time. That being said, she was a trooper, and expertly mixed it all up … without whining. What an awesome sidekick! Then it was time to let it rise. I was a little worried I hadn’t activated the yeast right (the temperature for the liquid was SUPER specific in the recipe), considering I’d never done it before. But, I managed to walk away for an hour and came back to it nice and doubled! The photos (above) are a little hard to compare, thanks to my lack-o-lining-up-the-shots … but it was doubled, trust me. Into the pan we go for one more rise. This is where I messed up. Instead of just LEAVING IT ALONE I tried to spread and shape it to the pan. Of course, it wasn’t going to shape. And all it did was cease to rise in the places I’d prodded. Lesson learned. Don’t touch the dough, Sarah! But that wasn’t going to stop me from trying to bake it! Hey look! It worked!! And boooooooy did it taste good! 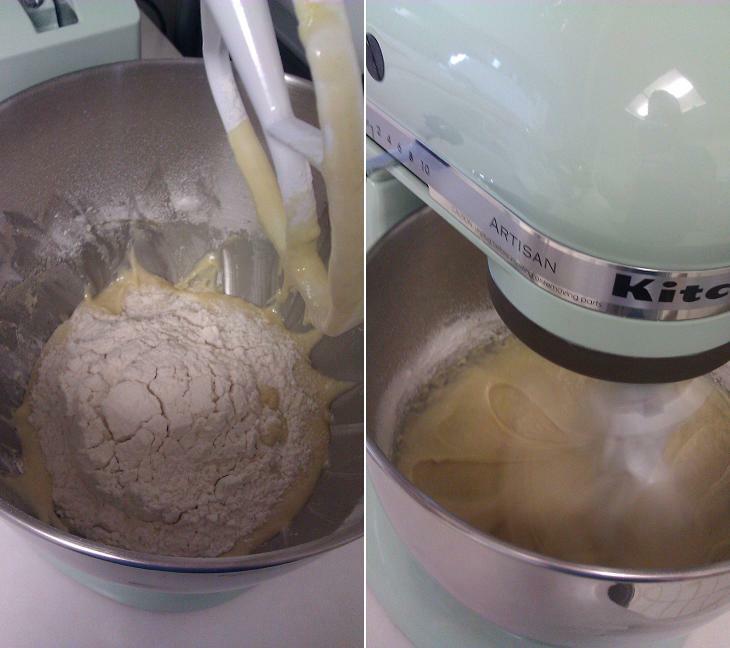 The husband is officially a convert … and has decided the smell of baking bread is the best ever. But we already knew that, right? Since it’s fresh, I’m thinking we can’t keep it any longer than 5 days or so. Does anyone have a better idea of time? I want to use what’s left (about a third of the loaf) for french toast (YES, PLEASE), but I’m not sure if I should. What do you guys think? So … total success! Fairly simple, no long processes, delicious. I’m calling it a win. 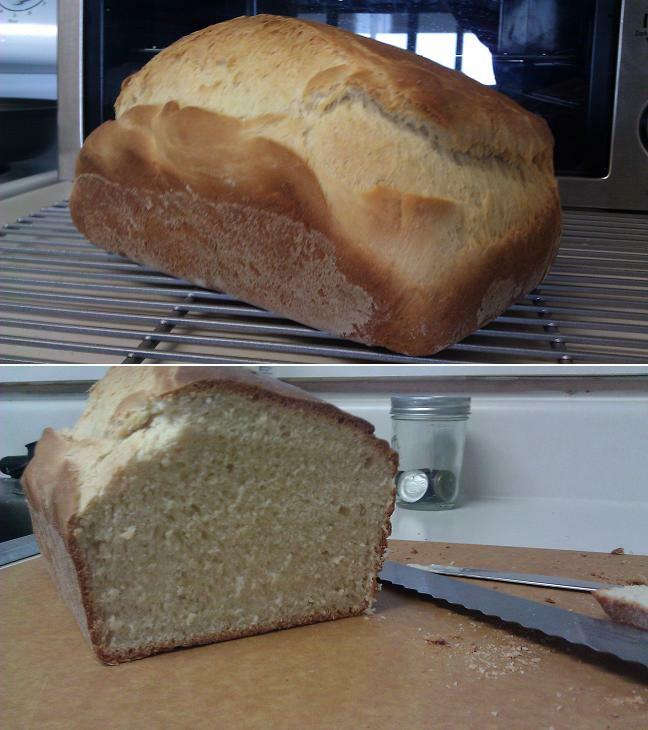 And, even though my loaf didn’t look like the recipe pictures, I’m still thinking it looked pretty damn good. Ooooh yummy! 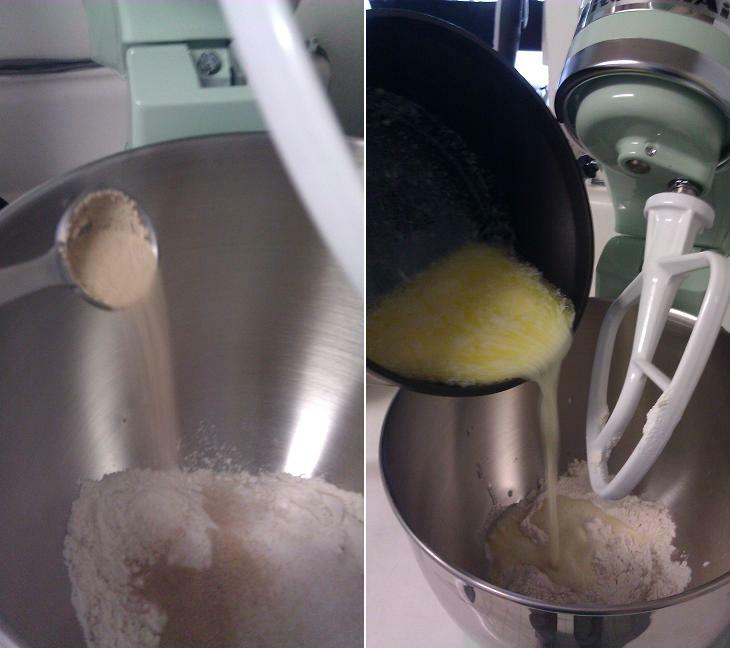 We bake bread with a bread maker and it only lasts about 3-4 days before getting little spots of mould. So I would use it up asap! I’m a big fan of cool, slice & freeze with homemade bread for the excess. Not quite the same ‘I just made bread!’ feeling, but you can definitely use it for sandwiches still. Truth. 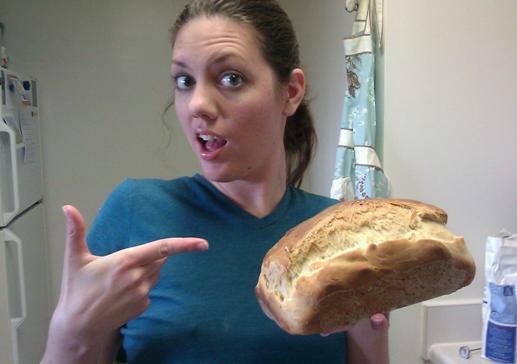 Luckily, this is a small loaf, and the recipe makes just the one, so the two of us will eat most of it right away. 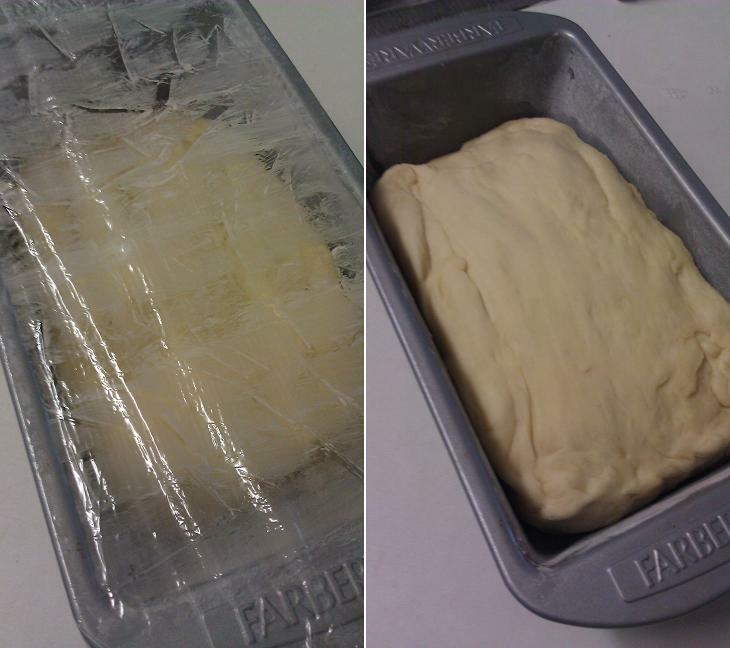 But slicing it before freezing is SMART … then you’re not out the entire loaf when you decide you need two slices. My general rule on bread is if it is not moldy it is edible. I have had that recipe sitting on my counter for months now and have been swearing I was going to make it. I simply have yet to find the time to bake bread. My husband thinks I am insane since we have a perfectly good bread maker in the cabinet but I keep telling him it is cooler if I make it by hand. In the end I don’t think he cares as long as he gets to eat the results. DO IT. The entire process took about 2.5 hours from start to finish … oh, and the middle hour and a half was for rising, so, time to clean up and relax. Then the last bit is baking. Like I said before, cleaning up and relaxing. Sarah, if you’re not going to eat it right away, bread freezes really well. Just wrap it tightly (plastic wrap in a ziploc) and when you’re ready to eat the rest you can let it sit out at room temp for about an hour or zap it in the microwave for 20-30 seconds. This works best if you freeze uneaten portions immediately (as opposed to after 3 days when you realize you won’t be finishing it…) – in other words, it will taste about as fresh out of the freezer as it did when you put it in. You made bread! You are awesome! (and obviously, so is Alice). It’s all Alice, I tell ya.